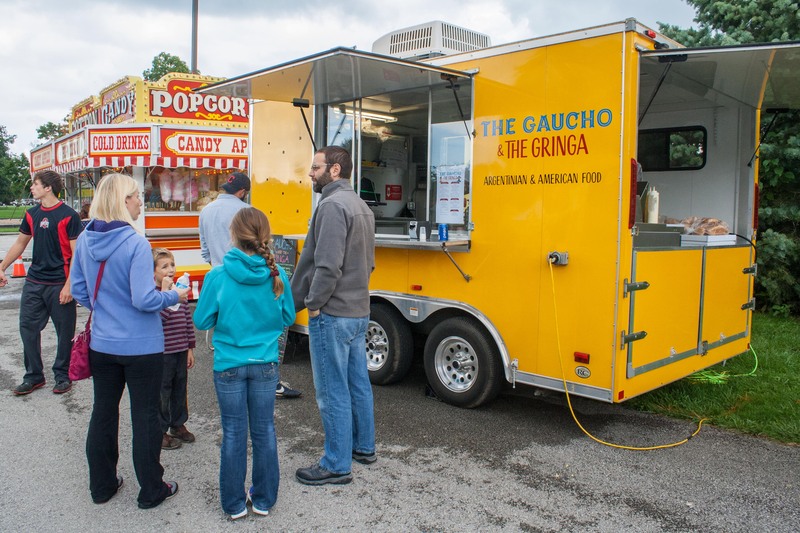 The 2018 food truck season is beginning! And…it’s snowing? Well, this is a first for us! But hey, no worries. We’re opening up this Wednesday in good faith that spring is (somewhere) around the corner. This year, we have an exciting lineup of events forming, as well as lots of new menu items that we’ll be rolling out. To start out the 2018 season, we’re introducing shrimp and cheese empanadas, as well as a spicy chimichurri that complements it perfectly! This is just the start of a variety of new empanadas we plan to roll out this year as part of our rotating specials list. Don’t forget to check our schedule to see where we’ll be this year. But, as always, if you’re trying to hunt us down, take a peek at our Facebook page for the latest location updates. We can’t wait to feed you all! Here’s to the start of an amazing new season! We’re just about to emerge from hibernation. This has been an eventful winter! On Christmas Eve last year, we welcomed our first child into the world! We had a boy, and his name is Roman. Check out this cuteness! 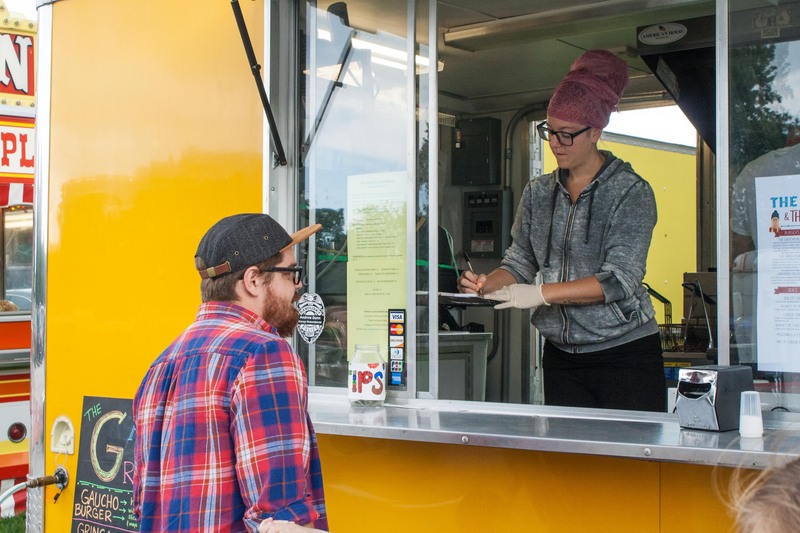 Now that we’re getting the hang of this new parent thing, it’s just about time to get back into food truck season! Hey, we planned that pretty well, right? This year, we’ll be opening MID APRIL again, with plans to start the season back at our daily location on Columbus Avenue at Accurate Business Machines. Our first event of the year will be EARTH DAY at Osborne Park on April 22nd. We’re still getting events confirmed and squared away for the year. We’ll post a full calendar soon, so you can know where and when to expect our food! And don’t forget, we love to do private events of all kinds…graduation parties, corporate picnics, birthday parties, even weddings! If you’re looking to have a unique food option for your next event, shoot us an email and let’s see what we can set up. We’re so excited for the year ahead! Can’t wait to spread the chimichurri around soon! The End of a Season! We’ve had a pretty stellar summer so far, huh? Well, now that we’re winding down to fall (which starts in two days, in fact! ), it also means that our food truck season is winding down as well. 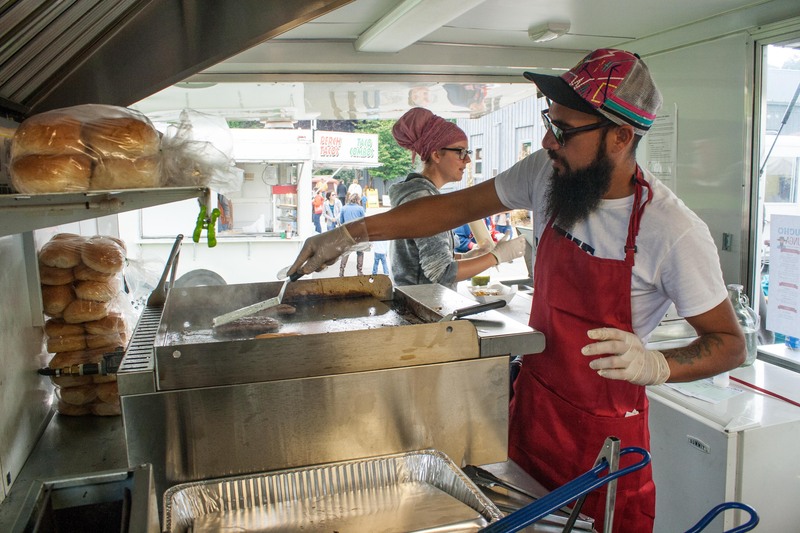 This was our first “full year” as a food truck, and we vowed to try it all. From graduation parties to private birthdays to Bike Week to Huron River Fest to gold mining weekends to the Jet Express in Port Clinton…we really dabbled in a little bit of everything! We thought this would be a good way to see what we really like…and it turns out, we liked it all! We just love serving our food to the community, no matter where we’re at! Getting to meet all of you fabulous folks, people we might have otherwise never met or connected with, really makes our job special. We count tons of new friends among the ranks of our customers, and that is one of the coolest perks we never saw coming. So come out and see us one last time for the season here in the Sandusky area. We’ll be at our daily spot for three more weeks, and we’ve got three more local festivals, and then we’re packing up and heading to MANSFIELD for their month-long Halloween spectacular at the prison. Check out our schedule for exact dates and locations. Hope to see you soon! But because we’re so booked up in July, we WILL NOT be appearing at Accurate Business Machines on Columbus Ave for the entire month. It’s sad, since I know it’s a sure-fire place to get your Gaucho Burgers, but just for July, we’re taking it off. We’ll be back to serving there in August, but again, it won’t be for the full month since we’ll be participating in the ERIE COUNTY FAIR (which is a week long) and then heading out of town for a wedding on a different week. As always, keep up with us on Facebook for the most up-to-date information about WHERE we are and WHEN we’ll be there! April Showers Bring…Food Trucks & Flowers? Spring has sprung in Sandusky, even though it’s been on-and-off springing since like, February. At any rate, we’re getting ready to haul our trailer out of its winter lair and BACK to the outside world! That’s right, our little yellow buggy is going to stretch its propane legs and get a good whiff of that spring Ohio air because we’ll be launching on April 19th! Our opening day this year will take place at Accurate Business Machines (where we were last year! ), resuming our Wednesday/Thursday/Friday lunch and dinner schedule in their parking lot. You can find us 11-2 and 4-7 on the days that we’re there! It’s a super convenient spot in Perkins Township if you’re looking for lunch or dinner on the go. April also sees two separate Earth Day events for this Gaucho and Gringa! On April 22nd, we’ll be at Mulberry Creek’s Faery Fest/Earth Day celebration from 10-5p. The following weekend, on Sunday April 30th, we’ll be setting up as Osborn Park’s Earth Day celebration too. What a way to start the season! We’ve got a lot of new things lined up for your taste buds, bellies, and general olfactory systems, so we hope to see you out there soon! EMPANADAS — an Argentinian staple. We’ll be serving up plenty of these as specials this year! We hope the winter has been pleasant and fun for you all so far! We’re still a couple months away from launching the 2017 season, and let me tell you, we couldn’t be more excited. Our resident Gaucho, Jorge, is still down in Argentina, soaking up his hometown flavors, binging on red wine and steak, and basically having a great time in the hot summer sun. A serene scene from La Punta, a tiny town near the sierra in central Argentina. But being 5,000 miles away doesn’t excuse him from his Grillmaster duties! Ohhhh, no. He and I have been hard at work figuring out what the heck our season is going to look like this year. We’ve got a lot in the works already. Including a whole spread of specials, which I’m pretty sure are gonna be raucously delicious. We’re taking plenty of notes. When I was in D.C. last weekend, my uncle showed me a food-truck-turned-brick-and-mortar Korean place, which is set up inside an Exxon Mobil gas station! I’ve never been so excited to eat food out of the same place where I fill my gas tank. They’re crazy successful, and gives me ideas of where our own crazy food adventure might lead us someday. Here are some shots of S(e)oul Food in Silver Spring, MD. Stay tuned for updates and our schedule. We can’t wait to see you all at our little window in the yummy yellow box (i.e. our trailer!). Wow. Is it really almost November? It’s hard to believe that we had our first event on September 9th this year. Almost two months later, it’s time to pack it up and head into food truck hibernation. We called this year our “Soft Launch”. Our late-to-the-game attempt to get our feet wet, see how we like it, and learn as MUCH as humanly possible in a rapidly shriveling window of time. And I’d say we managed it. Not only did we go from Zero to Launched in about 5 weeks’ time, we have a host of other experiences under our belt. We’ve made new friends, forged invaluable connections, participated in city events and tiny flea markets, traveled more than 20 miles from the home base, crossed Lake Erie, spilled a fryer, tried a daily location, and most importantly, we’ve been cooking our food and sharing it with the community. We’ve been blown away by the response. Truly, deeply flabbergasted. Who could have ever imagined that you guys would love our food so much? Well, we had hoped this might be the case–but we never thought the love would be so resounding and happen so FAST! Cheers to the Soft Launch Year! Where we got our feet more than wet (drenched, really) and we’re left SALIVATING for the year to come! On next year’s agenda, you can expect all the same great Gaucho & Gringa staples (our current menu…festival/event appearances…and a daily location) PLUS the addition of many Argentinian specials that we wanted to save for our first proper year in the game. We’ll unroll our schedule of events as things get settled in the coming months. We plan to hit the pavement in April, and serve allllll the way through October once more. Thank you all for supporting us, for giving us a shot, for spreading the word with your friends and family. It means SO much to us…and we can’t wait to keep bringing delicious, locally-sourced, fresh Argentinian/American food to the Northern Ohio community.